This time we found some fun things. The first is Large Flashing Neon Stretchy Noodle Ball Yo-Yos. These fun springy yo-yos come in four color combinations. The neon colors are pink, orange, yellow and green. Whichever color is the "handle" is not in the bottom part. Hazel and I thought they looked like Cousin It from the Adams Family, spiders and jellyfish. To bounce the yo-yos all you do is put the handle on your finger and the stretchy rubber/plastic just bounces. The tops have lights. To turn them on you squeeze the tops. However we found some work better than others and some are easier to turn on than others. Hazel is having so much fun with these. Here is her favorite thing to do. We also had fun singing "Itsy Bitsy Spider" with them. Hazel also thought it would be fun to play Jellyfish Tag. In the dark the kids run around with one of the yo-yos with the lights flashing and try to tag each other with them. 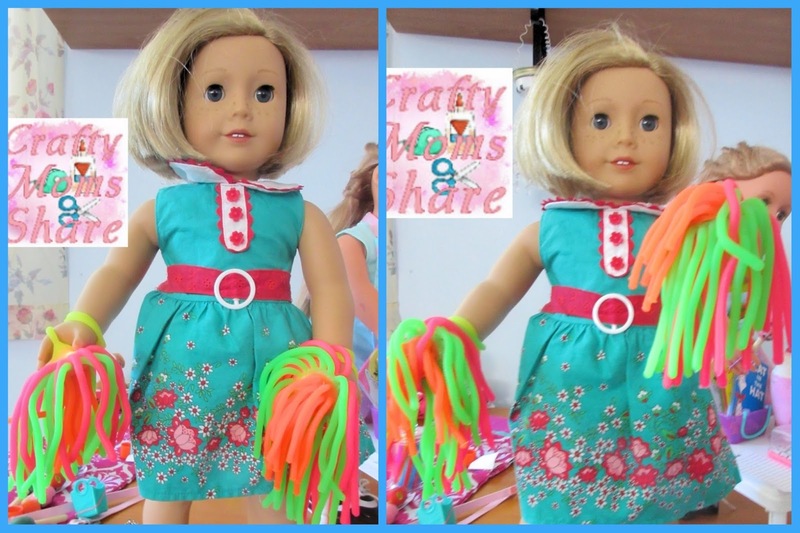 We also noticed they made great pom poms for Hazel's dolls. Kit decided to cheer the team on. 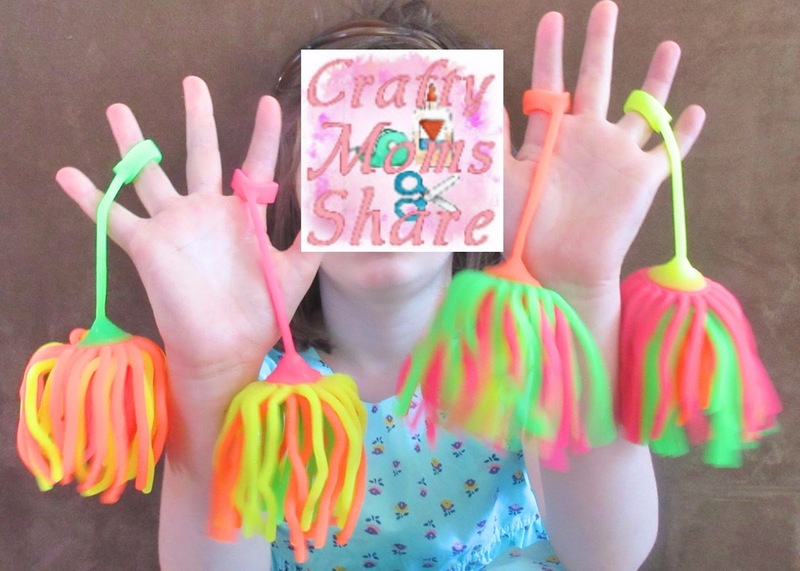 I put the handle around her wrists and wrapped the string around until it stayed in her hands. I needed an extra elastic on her left hand. 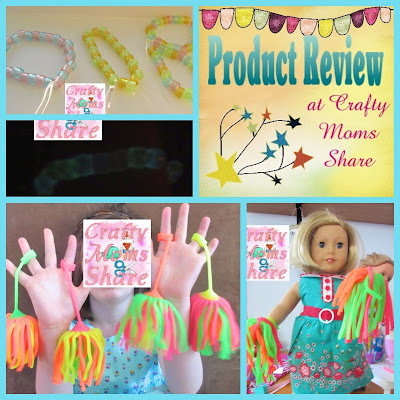 We are loving these fun stretchy yo-yos. We have only found a few cons with them. Hazel managed to break the stretchy handle off one of them pretty quickly. There is definitely a smell to them from the material they are made of. And as I stated earlier some of them were not easy to turn the lights on and didn't work as well. Otherwise we love them and keep finding uses for them. We also got Glow-in-the-Dark Pony Beads. Hazel could not wait to start stringing them. She made several bracelets. To get the beads to glow they need to be in light first. We placed the bracelets on the sunny windowsill. 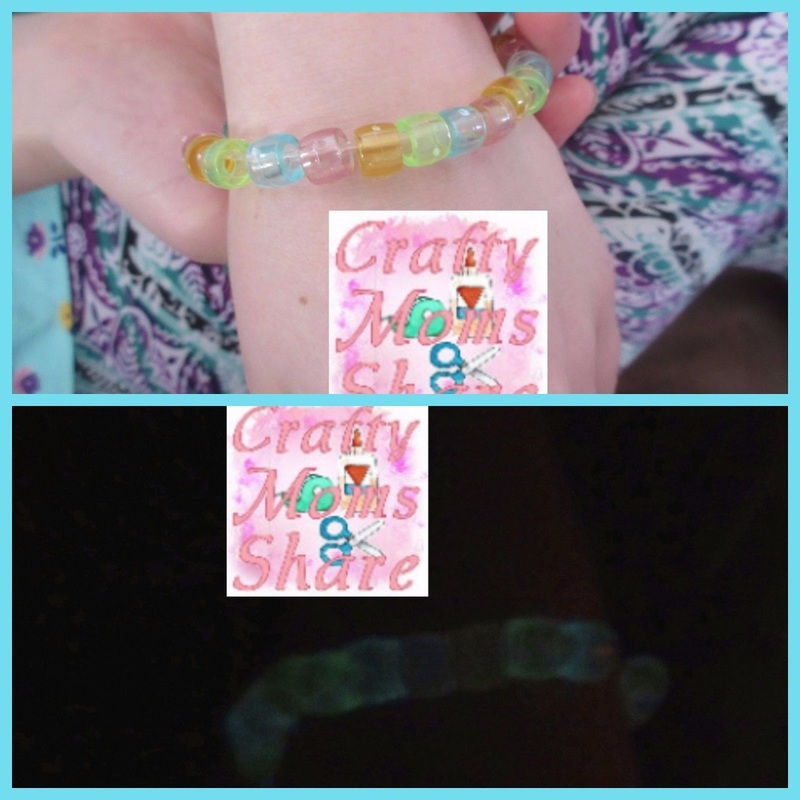 Then we checked them out.Here is the same bracelet in the light and the dark. Aren't they fun? 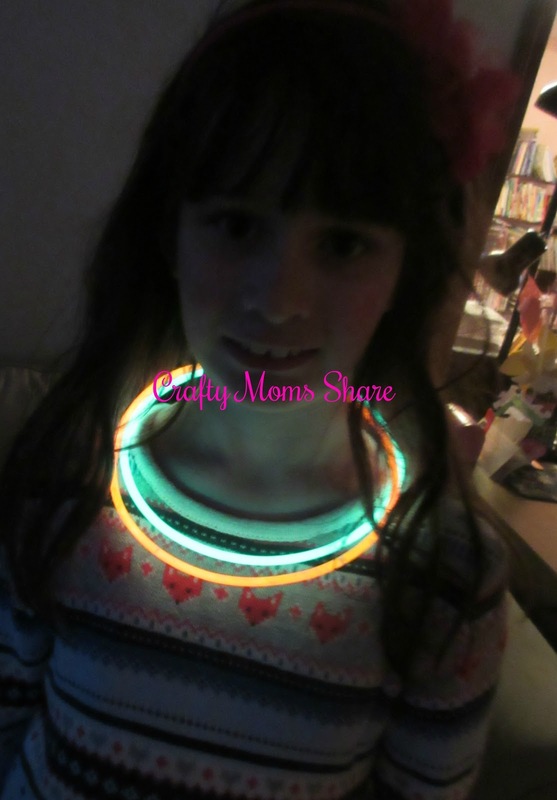 A little glow-in-the-dark jewelry is perfect for a kid on Halloween night. It gives another way for them to be spotted in the dark. Plus of course they are just fun. Are you ready to glow-in-the-dark? So I hope you will take some time to check out Oriental Trading's Halloween glow products. There are so many fun ones there for every kind of Halloween celebration!